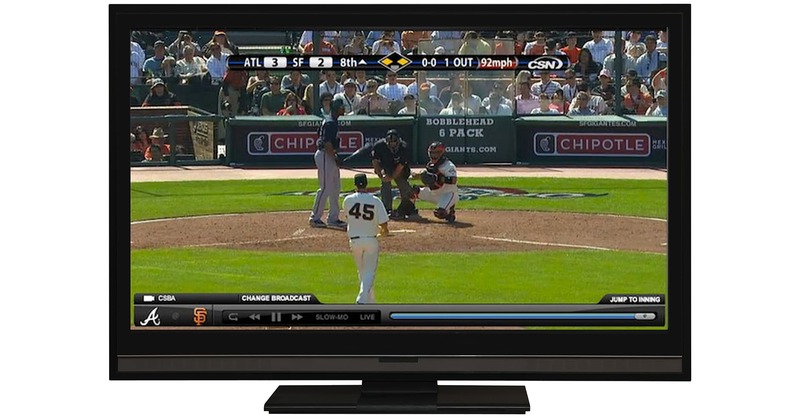 The MLB Streaming Video App: A Better Way to Watch Baseball | Blog | Sail Internet San Jose-Fremont | Fast, Affordable Internet. I’ll start by mentioning that if you want to watch every MLB game live for your local baseball team, the MLB streaming video app is not the whole story for you. But for the rest of us, it’s such a better viewing experience. And for me, it resulted in big savings as well. For years, access to live/local MLB games was the primary reason I stuck with my expensive Pay TV package. But eventually I just couldn’t justify paying the $110/month price. The math just didn’t add up at $1,320 per year. And the regular season only lasts 6 months! This worked out to $50/week during the MLB season just to watch baseball on my local Comcast Sports network. I’m willing to pay something, but not $50/week. And then I did the breakdown on how much I was paying to watch each individual live/local game. Often, our local ABC affiliate shows one game per week live on broadcast TV at a time when I’m available, for example Friday night. With my new over-the-air HD antenna, this game was already free. And with my busy schedule and many games played during the day, I was rarely able to watch more than one or two additional games per week live. I would typically DVR the game, and speed-watch the game late at night. I was paying $25-$50 per game watched. Unbelievable! At this price I could go to the ballpark and watch the game in person. And my DVR experience was often less than perfect. Every once in a while, something would go wrong with the DVR settings and I would miss the game entirely. And for the games that went deep into extra innings, the recording would often stop before the game was over – missing the best part. Now enter the MLB streaming video app that I recently downloaded onto my Apple TV. If you have another streaming media device, you can check the MLB.com website to see if your device is supported. I was already an MLB.com subscriber to obtain streaming audio broadcasts on my laptop computer and smartphone when traveling, at a price of $29 per year. I then realized that I could upgrade my MLB package to include streaming video for an additional $79 per season, and this would give me access to every MLB game for every team in a great new format. Spread over the year, this is only $6-$7 per month extra – a great value compared to my $110/month Pay TV package! The only restriction is that games from my local team are not available until 90 minutes after the last pitch. Given my viewing habits, waiting 90 minutes wasn't a problem and was a big savings. I may have switched to MLB streaming to save money, but I’m now sold on the enhanced viewing experience. No more complicated DVR menus and setup…. Each game is available in the app on-demand. No more fast-forwarding through commercials…. The MLB app allows me to individually select and view each half-inning, without commercials. No more missed games…. Even if it lasts six hours, I get access to the whole game. If I’m busy and don’t have time to watch the whole game, the MLB app offers a “condensed” version that shows all of the key moments in a short 10- or 15-minute package. And I now get access to every game for every team – not just my local team. For me, it’s a great value!